I am excited for today’s recipe. This is the first time I have ever made waffles. I tried it once on my old waffle maker and it didn’t work out at all. It was a mess!! So now I thought I would re-try and make waffles again and let me tell you, they turned out perfect! They are fat, crispy and ohhhh so perfect! 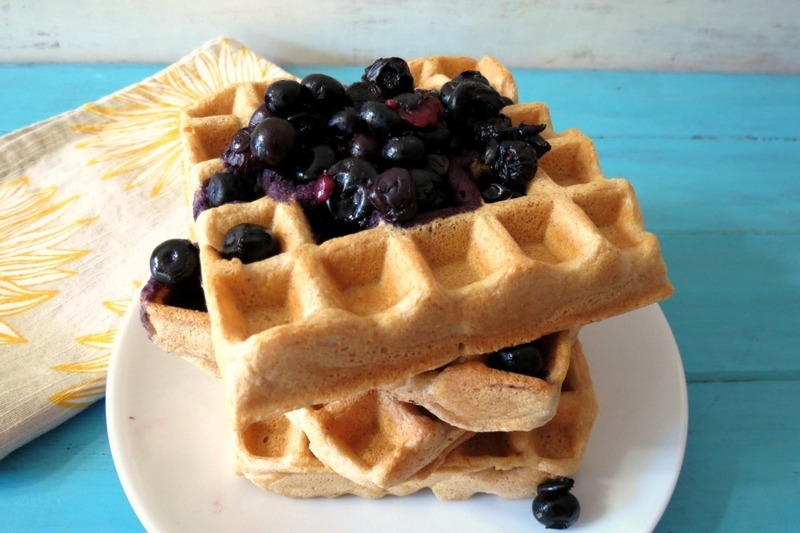 This is a healthy Whole Wheat Waffle topped with warmed blueberries. Oh baby! A perfectly filling breakfast. Really, one waffle filled me up for hours and my Husband ate two and he was stuffed! I think I am in love with my new waffle maker. I made the waffles a little light, but next time I may go a pinch darker, but all in all it turned out perfect. I got this recipe from King Arthur Flour. I did make some adaptions to make it dairy free, but as always I did add substitutes for my dairy friends. One thing I have been having an issue with being dairy free is fat and carbs. I usually use fat-free milk in recipes like this, but in this recipe I used unsweetened coconut milk. So I am still working on fat-free recipes. Any suggestions on a non-dairy fat-free milk, I would love that! Is there such a thing? This was the second half to my Husbands birthday breakfast. I served it with Thursday’s Candied Bacon. Oh I am still thinking of that bacon. 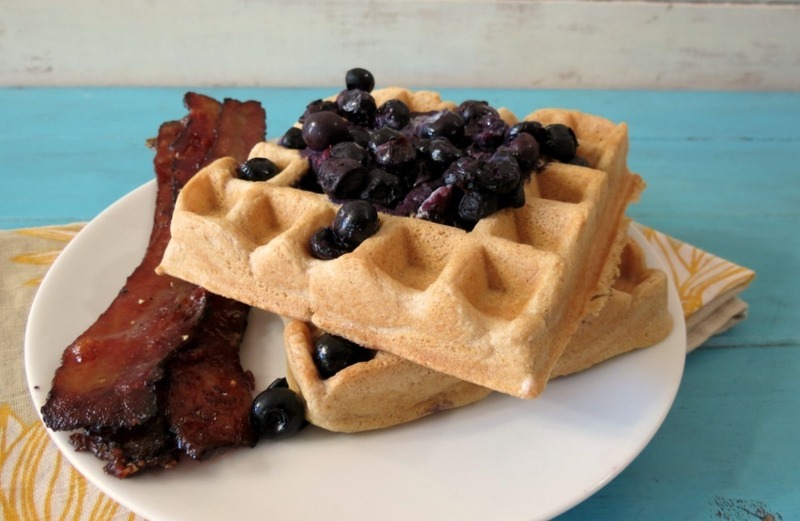 With the addition of maple syrup on the waffles and dribbled down onto the bacon, oh man so darn good! This was one heck of a good breakfast!!! We should have a birthday celebration every weekend! 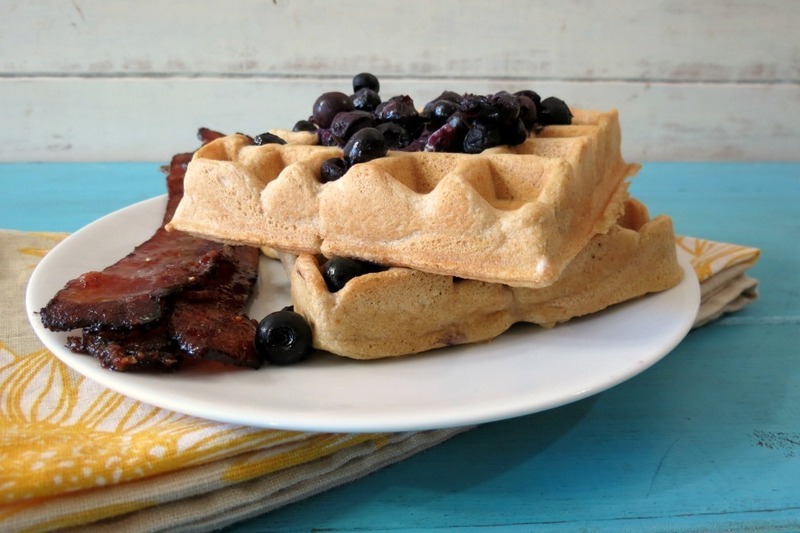 A light, crispy, healthy, dairy free whole wheat waffle topped with a simply sweet warmed blueberries. In a bowl add flour, baking powder, salt, and sugar; whisk until combined. In a separate bowl, whisk together the egg, coconut milk, and butter. Mix the egg mixture into the flour mixture; stirring just until combined. The batter will be a bit lumpy. Cook the waffles as directed in the instructions that came with your waffle iron. Note: If you use non-fat milk, you will have barley any fat in this recipe and higher protein. Calories will roughly be the same. Now that I know how to make waffles, I can’t wait to try out other recipes. 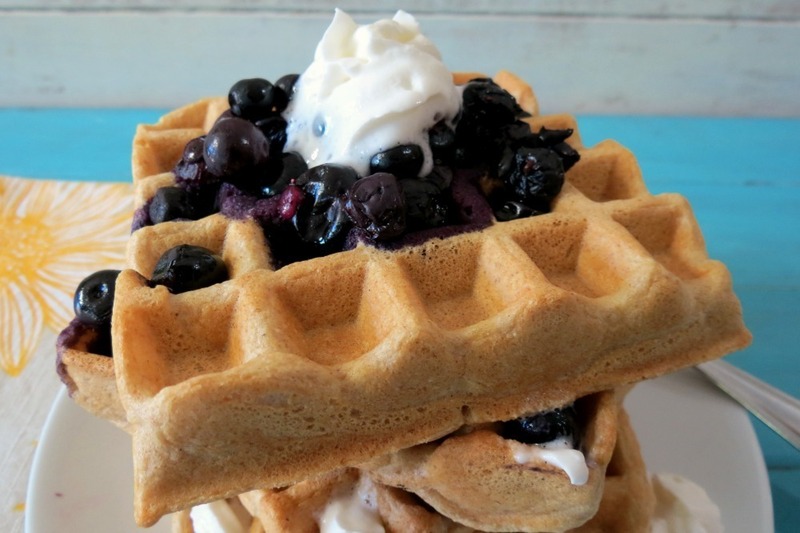 You know how I like to get all crazy with pancakes, so now it will be waffles. ha ha I can’t wait!! 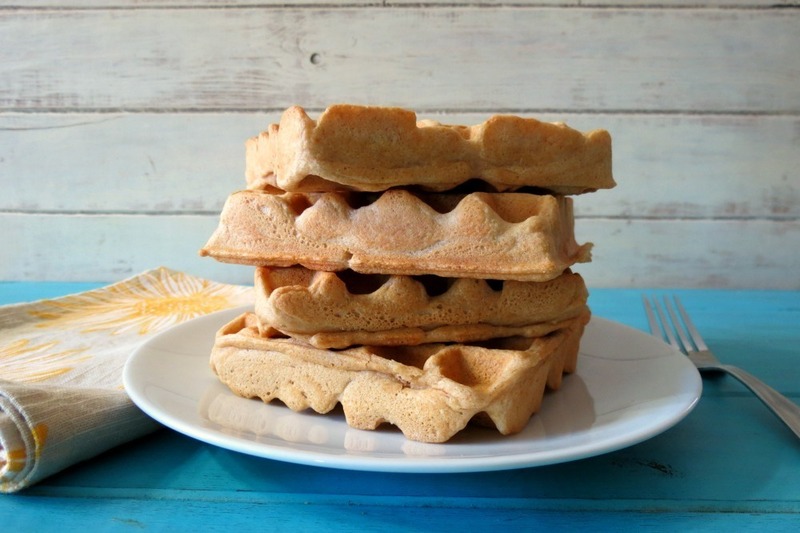 My goal is to be able to make a less calorie, higher protein waffle. I’ll get there! I’m still practicing on dairy free living. I can’t believe it is already November! Can you believe Christmas is next month? Are you ready for this? I’m not! Though I am looking forward to Thanksgiving this year? Not sure why, since it’s normally just my Husband and I, and I end up cooking a crazy big meal. But that means lots of fun leftovers! 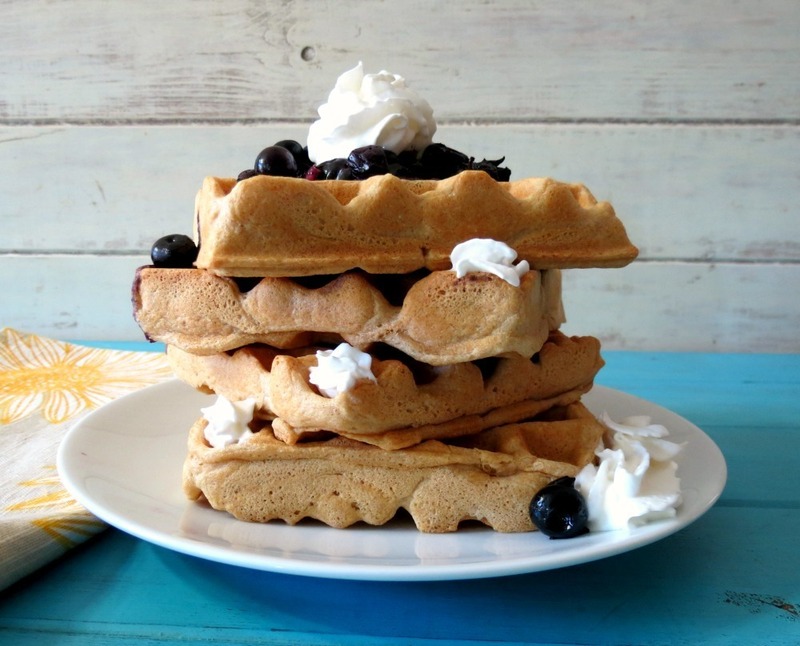 Gorgeous waffles! I used to have a wafflemaker and never used it so I gave it to my mom….bad decision! I want it back! Get the waffle maker back! 🙂 I had a crappy one that didn’t work, so I had to get a new one. 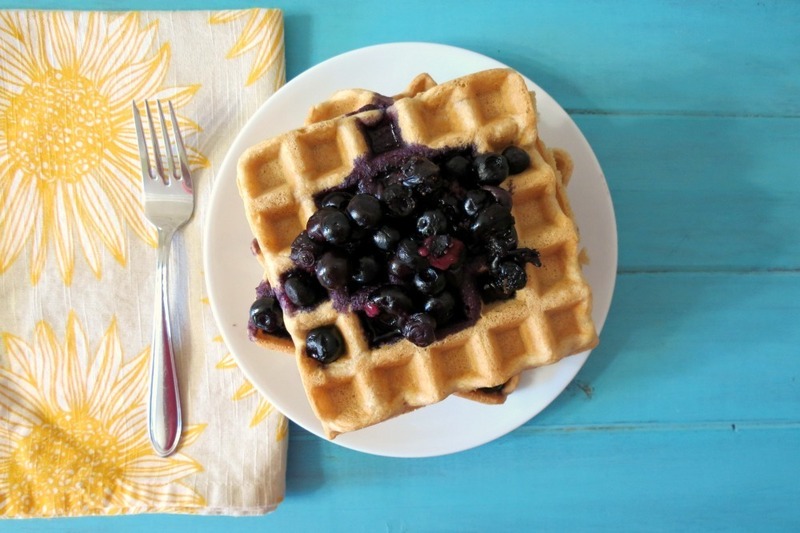 Waffles are so fun and easy!